AKM e.V. - Do cirrus clouds in jet streams have better optical properties? Do cirrus clouds in jet streams have better optical properties? 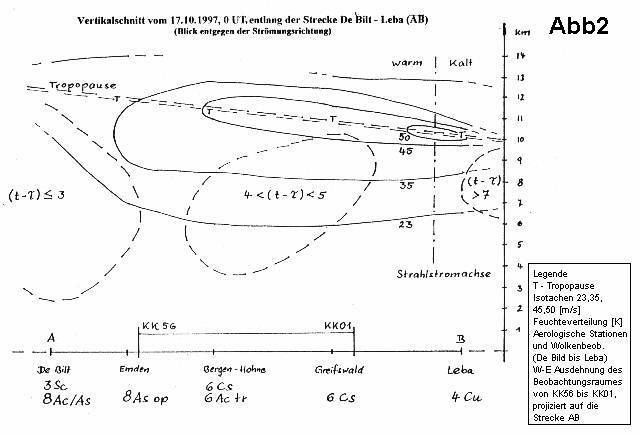 Were developed from the prominent wind points of the reports from radio probes and show the warm side of the jet stream as a kind of “flattened hose”. Unfortunately there are no statements available on how frequent colourful halos around the moon are. M. Minnaert writes: “…around the moon they are considerably fainter and colours can hardly be recognized.”. There you also find a hint that colourful halos around the moon have been observed several times. As it is possible that these were rare phenomena and there are enough data available, some reflections concerning cloud physics are to follow here. The appearing of the halos was caused by the warm front, while the extraordinary brightness of the phenomena was caused by the jet stream itself. The horizontal shear of speed could be neglected in our contemplations. But the vertical speed shear (S) within the whole height of the jet was important. If we look at the height interval between 6000 </=h</=9500 m, S was still small. Only above a height of h>/=9500 m S increased continuously. As the direction of the wind changed little, the current between 6000</=h</=9500 m can be concerned as flat. That means, in this interval the hexagonal symmetric ice particles were mainly orientated horizontally and also in direction (320°-130°). In the whole observation area as well as in the pressure interval 200</=P</=500hPa, the direction of the wind varied by about +-10°. Seen from the cloud physical point of view, the ice particles moved with the flat current, while vortices formed at the rims of the crystals were rather small compared to the current. Even collisions of ice particles of different kind should not have caused a change in primary orientation. According to A. Macke, the scattering and polarisation of the horizontal orientation depend on the geometry of illumination and observation. “While scattering on randomly orientated hexagonal ice crystals gives just concentric halo rings to the observer, which are situated around the direction of forward scattering, horizontally orientated crystals cause a lot of point- and ring-shaped scattering maxima”. If we now also contemplate the structure of the ice particles, so the lower range (up to 6500m) at t>/=-25°C was filled with hexagonal plate-shaped ice crystals in the defined interval of altitude. So hexagonally symmetric columns appeared only above h>/=6500 m (t<-25°C). Above an altitude of h>/=9500 m there were, due to the more intensive shear, stronger turbulences probable, so that there were more oscillating, horizontally orientated hexagonal columns. All these particles with their orientations were indirectly confirmed by the observation. If we look at the observation results in table 1, we can see a division between north and south. The 22°-halo (caused by randomly orientated columns) and the upper tangent arc (horizontally orientated columns) were bright in the north and faint in the south. The moondogs, however, were most brilliant in the south. The area of change-over might have been at KK34. Table 1 and figure 1 show that the south was considerably drier in 300hPa. As the temperature was between -48</=t</=-44°C at 300hPa from east to west between KK56 and KK01, it is probable that at a difference of the dew-point of 5</=(t-r)06K, the concentration of columns at the observation areas of KK01, KK38, and KK51 was considerably lower than in the north at P=300hPa. A large part of the columns having been transported to the south by the jet stream, might have been descended to lower layers earlier. At 500hPa it was rather warm with temperatures between -20°C and -17°C. 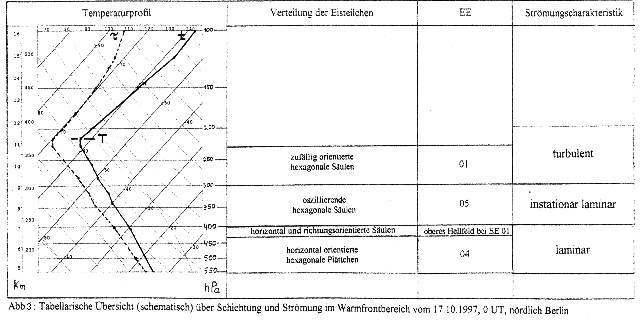 According to Malberg  there are the same amounts of exposed water drops and ice crystals present at the temperature range -20</=t</=-13°C, so that the columns probably changed their geometrical shape while sinking. At 600>/=P</=850hPa the southern area was rather dry, so that the light became hardly fainter. At KK59 the whole layer of frontal clouds was considerably thicker. So the moondogs reached only H=2. The data of KK56 do not fit into this picture because KK56 was not inside the jet stream area and already was under the influence of the other frontal system. Of course, this interpretation cannot answer all questions and is even problematic in some points. So this examination is set up as a description of a state. Clouds and fronts are constantly changing and so are more processes than states. Another problem is the influence of local parameters which cannot be determined aerologically and synoptically. But these can have a decisive influence on the visibility of halos when they for example change the geometry of illumination and/or observation. 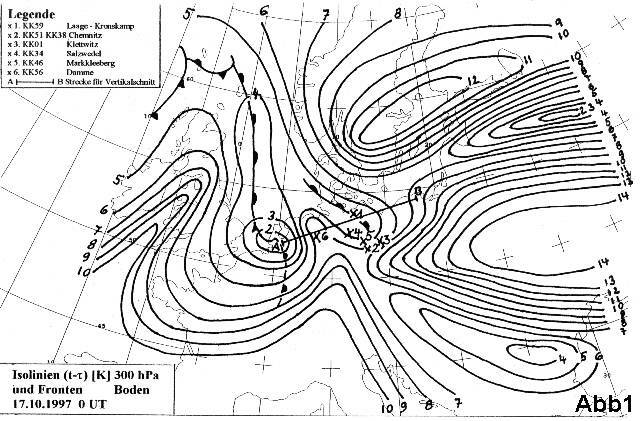 As the meteorological conditions could clearly be determined, (warm front in jet stream area) and these were stable over a longer period of time, and only then, such an examination makes sense. So it is possible to gather more and more data which can serve for later analyses and projects. Interpreting the phenomena of October 16, 1997, it became clear very soon that one could have written several pages on this problem. As an examination of state and a short interpretation using synoptic and aeriologic data has already been characterized extensively, I renounce from explanations in part 1. Later it became clear that some explanations are vivid for understanding the connections. In this part now the interpretation already made will be tested by a simulation with HALOET and some examinations will be explained more closely. are possible at all. In this case it is cirrostratus connected with a front. So the ice particles formed at the place being by one mass of air gliding upon another. So the difficult determination of the points where the trajectories of the particles to contemplate began is not necessary. Figure 3 gives a general survey of the state of the troposphere in the area of the warm front on October 17, 0 hours UT and is valid only for the northern area. Up to discussion is here the appearance of the sundogs, the upper tangent arc and the 22°-halo in the observation area of KK 59, who observed on October 16 after 19.02 hours CET. An assignment of the different types of ice particles in the whole layer was possible concerning the profile of temperature as it is known rather well at which temperatures columns and plates form. The dew-point difference (t-r) gave a hint on the concentration of the hexagonal cloud particles in the corresponding layer. The orientation of these particles was determined exclusively by the jet stream. The characteristics of the current were elicited from different criteria and refer to the corresponding volume dV of the observation area V. although the current of the troposphere tends to form turbulences under certain circumstances, also flat currents can form. If we contemplate in figure 3 not only the distribution of the ice particles but also the characteristic of the current, we see four layers with different optical properties. In the first layer the flat current dominated. The increase of speed was here at 5 m/sec each 2.5 km. The speed components v and w could not be measured, so that the problem became reduced to the simple shearing current . As the cinematic viscosity of air is small, small-scale turbulences had to be considered in any case. In this case, however, the difference in speed to the current was small enough, so that these possible turbulences could not change the primary orientation of the plates. The layers could not mix because the stacking was humid and stable. As there were no inversions detected in this layer, there were no larger variations in the density of the air. From the temperature (t<-25°C) and the flat current it could be assumed that there were horizontally orientated columns, so that in the second layer the columns had a determined orientation. In the third layer the flat current became increasingly instationary by measurable oscillations in the wind field and the density of the air, so that the mainly horizontally orientated columns oscillated with an increasing amplitude. Above 300 hPa the oscillations were so big that despite the increasing speed of wind the horizontal orientation became a randomly one and the flat current changed over into a turbulent one. The halos observed can now be associated with these layers of frontal cirrus. This chapter does not treat with the simulation of the relation between phenomenon and particle, but with a check of the modelled optical properties of the cirrostratus. According to A. Macke, multiple scattering is good for the examination of the optical properties of cirrostratus. The aim was to get a picture of the scattering (figure 4) from the basis of the modelled state, which has to agree with the observation under the conditions of multiple scattering. As the possibility to get cloud physical reflections on the basis of aeriological measurings is limited and so the model had to be supported by aeriological reflections, I will here renounce from an analysis of the light paths. As frontal clouds were more spread vertically than horizontally, I fixed the elevation a bit higher (at 10°), so that the light had to pass a longer way through the cloud. In the beginning each optical layer was simulated separately and the parameters were tested. To determine the threshold values, the exact data from G. Busch and B. Kunitz were necessary. Figure 4 shows the result of the simulation with all layers and the table shows the parameters. As in HALOET it is only possible to determine the diameter of the whole layer, the diameter of each layer was determined by the portions of the types and orientations of the crystals. The portions become clear by the concentrations of the kinds of crystals in the according layer, which are a function of (t-tau). 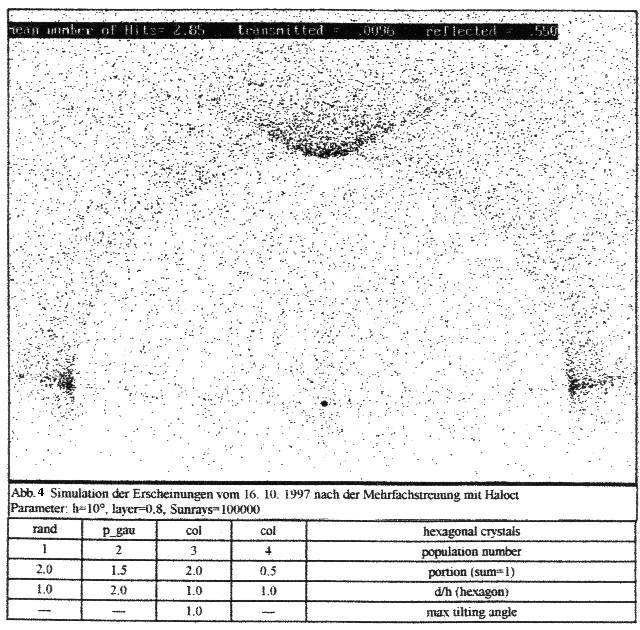 At first sight, the picture of the scattering (figure 4) shows the scattering maxima for the moondogs and the upper tangent arc. The small ring (22°-halo) stands out by a different distribution of the pixels outside the ring compared to its inside. The brightness is greater outside the ring than inside, what also fits well with the observation. According to the records on the variations of the 22°-halo of that day, the differences in the brightness of the areas were unusually big from time to time. Expressed in nuances of grey, it was dark white to bright grey outside the ring from time to time, while on the contrary dark grey to black could be observed inside, and that in bright moonlight. The scattering maximum of the horizontally orientated columns cannot be recognized because it is superimposed by the upper tangent arc and the 22°-halo. This light above the 22°-halo was really not observed. It could only be recognized in the single simulation. Oscillating plates can also cause a 22°-halo, when the tilted angle is big enough. A simulation made by E. Tränkle  shows that under certain conditions this one can also be formed by rotating plates in connection with Lowitz arcs. The conditions of the current on October 16, however, did not allow such a variant of formation. In my opinion, there were no Lowitz arcs observed in this period of time. G. Busch observed a 46°-halo (not complete), and C. Hetze was able to recognize a Parry arc, an observation that also supports the theory described above. It is a matter of fact that there also appeared some problems in these reflections. The biggest difficulties appeared at the determination of the layers according to hydrodynamic criteria. As the conversions to different properties of the current go on continuously, the biggest uncertainties appear here. If the different diameters of the layers are elicited in other ways, these vary against each other, but do not change the diameter of the whole layer. Due to the limited exactness of the measurements of the radio probes, cloud physical reflections are possible only in a limited way and have to be realized with the biggest caution possible. If we consider that the sizes of the ice crystals are in the mm-range, there appear additional problems in the adaptation of the pattern. Obviously the program HALOET is only designed for the simulation of solar halos. Reflected light, however, has a bit different optical properties. I tried to compensate this circumstance by renouncing from optimating the parameters, so that one can say that the scattering maxima have been formed under more difficult conditions. Cirrus clouds which are under the influence of strong wind fields and/or jet streams, have under certain conditions – in part considerably better optical properties than clouds which are situated in areas with weak winds. But optical properties become better only when the current leads to most favourable orientations of the ice crystals which then cause the halos. The ice particles have also to be present in a sufficiently high concentration. Now it is a question of corrobating this result by a series of observations. If this result should be confirmed in future, there is an important consequence for halo observation. The better optical properties of ice clouds in jet streams and/or fields of strong wind make the observation of phenomena possible which under normal circumstances are hardly or difficult to observe due to their faintness. As the jets are constant over a longer period of time there theoretically would be enough time to prepare such observations. If it should be necessary in future to model out halos and/or halo displays according to hydrodynamic, thermodynamic and optical points of view, then in any case specifications regarding the variations of the different phenomena are also necessary. Marcel Minnaert, "Licht und Farbe in der Natur", Birkhäuser Verlag 1992, S. 263. Andreas Macke, "Modellierung der optischen Eigenschaften von Cirruswolken", Dissertation, Hamburg 1994, S. 61. Horst Malberg, "Meteorologie und Klimatologie", Eine Einführung, 2. überarbeitete Auflage, Springer-Verlag 1994.